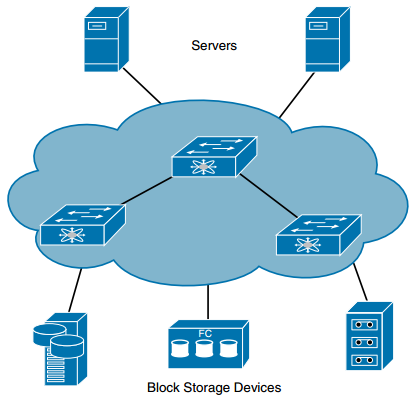 a. Block-level storage systems are very popular with storage area networks. b. They can support external boot of the systems connected to them. c. Block-level storage systems are generally inexpensive when compared to file-level storage systems. d. Each block or storage volume can be treated as an independent disk drive and is controlled by an external server OS. e. Block-level storage systems are well suited for bulk file storage. Block-level storage systems offer better performance and speed than file-level storage systems. Each block/storage volume can be treated as an independent disk drive and is controlled by the external server OS. Each block/storage volume can be formatted with the file system required by the application (NFS/NTFS/SMB). Block-level storage systems are very popular with storage-area networks (SANs). Block-level storage systems are more reliable, and their transport systems are very efficient. Block-level storage can be used to store files and also provide the storage required for special applications such as databases, Virtual Machine File Systems (VMFS), and so on. Block-level storage systems can support external boot of the systems connected to them. Answer: A, B, and C. The advantages of SAN can be summarized in the following areas: consolidation, storage virtualization, automation, integrated storage, information lifecycle management, and business continuity. Answer: A and D. CIFS and NFS are file-based protocols. SCSI, Fibre Channel, iSCSI, FCIP, and FCoE are block-based protocols. a. Integrated large scale disk array. b. Centralized controller and cache system. c. It is used for mission-critical applications. Answer: A, B, and C. The characteristics of Tier 1 storage are the following: integrated largescale disk array, centralized controller and cache system, capability to replicate between one or more devices, 10+K IOPS, and primarily structured data. Tier 1 use cases are transactional data: online retail, database, transaction processing, and mission-critical applications. a. A dual-ported HBA has three WWNs: one nWWN, and one pWWN for each port. b. Every HBA, array controller, switch, gateway, and Fibre Channel disk drive has a single unique nWWN. c. The domain ID is an 8-bit field, and only 239 domains are available to the fabric. d. The arbitrated loop physical address (AL-PA) is a 16-bit address. Answer: A, B, and C. A dual-ported HBA has three WWNs: one nWWN, and one pWWN for each port. Every HBA, array controller, switch, gateway, and Fibre Channel disk drive has a single unique nWWN. The domain ID is an 8-bit field; only 239 domains are available to the fabric. Q7. Which process allows an N Port to exchange information about ULP support with its target N Port to ensure that the initiator and target process can communicate? Answer: C. PRLI is the initiator to target a process login requesting an FC-4 session. Q8. Which type of port is used to create an ISL on a Fibre Channel SAN? Answer: A. Expansion port (E port) is used to create an ISL. a. An HBA or a storage device can belong to only a single VSAN—the VSAN associated with the Fx port. b. An HBA or storage device can belong to multiple VSANs. c. Membership is typically defined using the VSAN ID to Fx ports. d. On a Cisco MDS switch, one can define 4096 VSANs. Answer: A and C. An HBA or a storage device can belong to only a single VSAN—the VSAN associated with the Fx port. Membership is typically defined using the VSAN ID to Fx ports. On a Cisco MDS switch, up to 256 VSANs can be configured in a switch. Of these, one is a default VSAN (VSAN 1), and another is an isolated VSAN (VSAN 4094). User-specified VSAN IDs range from 2 to 4093. Q10. Which of the following options are correct for iSCSI? Answer: B. iSCSI uses TCP (typically TCP ports 860 and 3260) for the protocols itself.